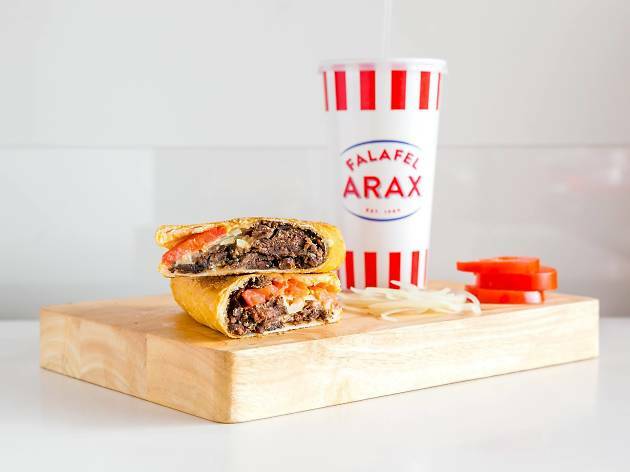 Falafel Arax has been an L.A. institution since 1980, and with some shiny new Studio City & Glendale locations, it’s starting to spread around. The cash-only mecca does falafel better and cheaper than most ($0.70 a piece! ), as well as plates, sandwiches and specialty Armenian sausage. Load up a plate full of all the goodies you want, and don’t forget to add grape leaves. Incredible falafel at this Lebanese Armenian standby make it worth braving the snarled intersection of Normandie and Santa Monica. 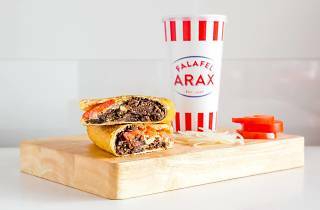 A small storefront with only a few booths inside, located it a standard nondescript LA strip mall, Falafel Arax nevertheless delivers on big, crave-able flavor. Perfectly crispy on the outside, light on the inside, your falafel plate will come with fresh lettuce and tomato literally drenched in hummus. The hummus edges on the bitter side, but is the perfect complement to every menu item here. The shawarma has an almost indescribably aromatic taste to it, a hint of sweetness to its savory side. Service is fast and polite, and you'll definitely have leftovers.